Tasty succulent and totally customised burgers every time - just how you like them! Want to vamp up meal times? Enjoy tasty and delicious stuffed burgers from home! Do you feel as though meal times have become a little boring? Or maybe you’re a burger fanatic but struggle to get your teeth into the truly perfect burger anywhere? Fear not! 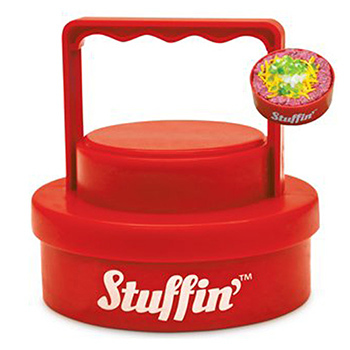 Because we have the Handy Gourmet Stuffin’ Burger Maker at your service! Get stuffin’ your face with deliciously moreish, homemade burgers! Plain burgers are now a thing of the past, and quite frankly pretty boring! What’s more is that you don’t even need to worry about washing it up, as you can pop it straight into the dishwasher. It really can’t get any better. Great food, easily made and no washing up! Don’t delay getting your hands on the Handy Gourmet Burger Maker today!